We’d love your help. Let us know what’s wrong with this preview of Kathleen by Christopher Morley. The Scorpions were to meet at eight o'clock and before that hour Kenneth Forbes had to finish the first chapter of a serial story. The literary society, named in accordance with the grotesque whim of Oxford undergraduates, consisted of eight members, and it was proposed that each one should contribute a chapter. Forbes was of a fertile wit, and he had been nominated the fi The Scorpions were to meet at eight o'clock and before that hour Kenneth Forbes had to finish the first chapter of a serial story. The literary society, named in accordance with the grotesque whim of Oxford undergraduates, consisted of eight members, and it was proposed that each one should contribute a chapter. Forbes was of a fertile wit, and he had been nominated the first operator. He had been allowed the whole Christmas vacation to prepare his opening chapter; which was why on this first Sunday of term while the rest of Merton College was at dinner in hall, he sat at his desk desperately driving his pen across the paper. To ask other readers questions about Kathleen, please sign up. Sin duda, una deliciosa comedia de enredo, de mano de uno de los grandes escritores de los años 1890/1957. Un obra que se lee en un día, y que provoca más de una carcajada. קתלין היא קומדיית מצבים משעשעת על חבורת בחורין שמוצאים מכתב בחנות ספרים ומדמיינים את הדמויות ואת הסיפור שמאחורי המכתב. כשהם בחופשה, הם מבקשים להכיר את קתלין הדמות המרכזית במכתב שנראית להם בחורה צעירה מלבבת. לשם כך הם מתחרים בהמצאת דמויות כדי להיכנס לביתה. הסיפור מתמקד בשלב בו הבחורים נכנסים לבית בדמויות הממוצאות דבר שגורר קומדיית מצבים משעשעת. Es muy probable que esta novela no merezca tantas estrellas como cuatro, pero yo me lo he pasado tan bien, y me ha dejado tan buen sabor de boca, que se las pongo igualmente. De vez en cuando es necesaria una lectura ligera que descongestione el cerebro de otras más densas o "intensas". Al final esta obra es casi una farsa: situaciones inverosímiles, comedia física e identidades erróneas. Una de esas comedias donde los personajes mienten sobre quiénes son y hay muchas entradas y salidas de escena. Es muy probable que esta novela no merezca tantas estrellas como cuatro, pero yo me lo he pasado tan bien, y me ha dejado tan buen sabor de boca, que se las pongo igualmente. Al final esta obra es casi una farsa: situaciones inverosímiles, comedia física e identidades erróneas. Una de esas comedias donde los personajes mienten sobre quiénes son y hay muchas entradas y salidas de escena. Fun, but not nearly up to the level of Parnassus on Wheels. 4.5 stars. Having enjoyed several of Christopher Morley's books, I'd been wanting to read some more, and picked this one as a likely-looking summer read. I wasn't disappointed! It's a charming, light-hearted little comedy—quite short; I read it over the course of a morning, and laughed out loud pretty frequently while doing so. The story, set around the the time the book was published—1918, I believe—concerns a literary club of Oxford students who have undertaken to write a serial story between t 4.5 stars. Having enjoyed several of Christopher Morley's books, I'd been wanting to read some more, and picked this one as a likely-looking summer read. I wasn't disappointed! It's a charming, light-hearted little comedy—quite short; I read it over the course of a morning, and laughed out loud pretty frequently while doing so. קומדיית טעויות קצרה על חבורת סטודנטים בקולג׳ באוקספורד שנתקלים במכתב של נערה לאדם בשם ג׳ו כותבים סיפור בהמשכים עליהם ואז מתחרים מי יפגוש אותה ראשון ולצורך כך מתחזים לאנשים שונים. קצר, אולי מדי, ונחמד. יכול לשמש בסיס להצגה קומית תקופתית. Comedia de enredo de estilo british muy recomendable. Se lee en un suspiro. What I found most interesting was a sentence when the character Blair first meets the captivating Kathleen; "She was that most adorable of creatures, the tweenie, between girl and woman, with the magic of both and the weaknesses of neither. *" It has been widely accepted that J.R.R.Tolkien first used the term "tween" in his 1954 book The Fellowship of the Ring in which Frodo is described as being in his "tweens" - which for a Hobbit woul Fun, but not nearly up to the level of Parnassus on Wheels. What I found most interesting was a sentence when the character Blair first meets the captivating Kathleen; "She was that most adorable of creatures, the tweenie, between girl and woman, with the magic of both and the weaknesses of neither. *" It has been widely accepted that J.R.R.Tolkien first used the term "tween" in his 1954 book The Fellowship of the Ring in which Frodo is described as being in his "tweens" - which for a Hobbit would be between childhood and the age of thirty five. Kathleen, published in 1918, far pre-dates the Tolkien reference and I hope somehow Christopher Morley can be given credit for coining this term. On the strength of the other Christopher Morley books I've read recently, I picked up this short story which was said to be hilariously funny. And while there were a few moments which made me laugh out loud, I'd have to say that the humor is what I've come to expect from Morley, low-key, a bit sly, but nothing too raucous. The Kathleen of the title is a young woman who becomes known to a group of undergrads through a misplaced letter to someone named "Joe." Over the rest of the term, the young m On the strength of the other Christopher Morley books I've read recently, I picked up this short story which was said to be hilariously funny. And while there were a few moments which made me laugh out loud, I'd have to say that the humor is what I've come to expect from Morley, low-key, a bit sly, but nothing too raucous. The Kathleen of the title is a young woman who becomes known to a group of undergrads through a misplaced letter to someone named "Joe." Over the rest of the term, the young men play a literary game during which they create a persona for Kathleen, and fall in love with her. When their break comes, they decide they're going to go seek her out, and the man who can get to know her and convince her to come to the college for some event, is the winner of the contest. Yeah, it's a little stalkerish, but not to worry, these boys are essentially decent sorts who are more interested in besting each other than ever really making any headway with Kathleen who they have elevated to almost royal status. It's a silly story about a group of young students who are still fairly gauche, and don't really know how to talk to young women. There are misunderstandings, and wild foolishness, and in the end they confess, and no one wins the game, so no one is hurt or rejected. All in good fun. Kathleen is a short, lively little novel by Christopher Morley. It's a slice of early 20th Century Oxford life--It's what Oxford was probably like when Dorothy L Sayers' Lord Peter Wimsey was earning his First in History and swatting balls all over the cricket field. And, I am SO turning into a Christopher Morley fan-girl. I loved The Haunted Bookshop. And now I've loved Kathleen. It's like Wodehouse. But better. I'm getting all gushy and I don't think I can help it. 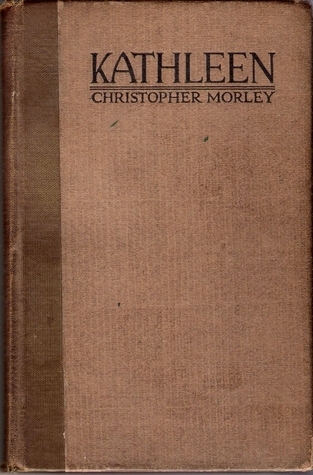 Morley's book brings us the S Kathleen is a short, lively little novel by Christopher Morley. It's a slice of early 20th Century Oxford life--It's what Oxford was probably like when Dorothy L Sayers' Lord Peter Wimsey was earning his First in History and swatting balls all over the cricket field. And, I am SO turning into a Christopher Morley fan-girl. I loved The Haunted Bookshop. And now I've loved Kathleen. It's like Wodehouse. But better. I'm getting all gushy and I don't think I can help it. Morley's book brings us the Scorpions, a literary society made up of Oxford undergraduates whose purpose seems to be to write witty poetry, share literary papers, and to put together a smashing serial novel penned in turn by each member. Kenneth Forbes has been elected to start the serial off with a bang and has been given the entire Christmas vacation to use his fertile imagination to produce the opening chapter. So of course, in true undergraduate style, he is spending the first Sunday of term "at his desk desperately driving his pen across the paper." The Scorpions will be invading his rooms for their weekly meeting in about two hours time. But Forbes has come up with a winning opener. While browsing at a bookstore, he discovers what appears to be a mild love letter from "Kathleen" to her beau "Joe." He decides that the Scorpions should use the letter as their guide--writing their story about the trials and tribulations of the couple's romance and only using people actually mentioned in the letter as characters. His fellow society members think this is a ripping good idea and they spend the term producing the saga of Kathleen and Joe--and in the process, Kathleen becomes the ideal woman for each of them. They soon decide that it would be great fun to descend upon Kathleen's hometown and attempt to meet the woman of their dreams. A contest is suggested in which each member is to make whatever arrangements he might (so long as they are not distressing to Kathleen and her family) and the winner will be the one who succeeds in speaking with Kathleen and having her agree to visit them in college. What follows is an onslaught of disguises, telegrams, and humorous hijinks. Great fun indeed! This was so much fun. I started it at 7:30 last night and could not go to bed until I finished the last page (midnight). I couldn't wait to see what disguise, what elaborate plan each society member would come up with next. The events of the dinner party at Kathleen's house are the highlight of the adventure and it was all laugh-out-loud terrific. Morley writes with such simplicity; he was an absolute delight after wading through the over-done prose of Stevenson. Me encantó la originalidad de la historia, es fresca, divertida y te envuelve rápidamente. Las bromas que se juegas estos románticos estudiantes los llevaran a absurdas situaciones y cómicas experiencias. Quedé gratamente complacida con su lectura. Morley nunca decepciona. Ya es el tercer libro suyo que leo y, aunque a partir de la sinopsis esperaba otra cosa, me ha gustado esta breve historia porque sigue teniendo su encanto. Tiene ese aire de comedia de enredo clásica. Una buena opción para pasar un buen rato una tarde. A very short book but very different and quite funny. A really entertaining story with a generous heap of humor about the Scorpions, a group of Oxford undergraduates of a literary club, who stumbled upon a letter written by a Kathleen to a Joe. Using the characters of Kathleen and Joe as the heroin and hero of their written composition, these lads made numerous conjectures to fill in the spaces of the personalities of both Kathleen and Joe, given the narrow perspective offered by the letter itself of the personalities of its writer & its receiv A really entertaining story with a generous heap of humor about the Scorpions, a group of Oxford undergraduates of a literary club, who stumbled upon a letter written by a Kathleen to a Joe. Using the characters of Kathleen and Joe as the heroin and hero of their written composition, these lads made numerous conjectures to fill in the spaces of the personalities of both Kathleen and Joe, given the narrow perspective offered by the letter itself of the personalities of its writer & its receiver. The undergraduates then took a bigger step by using the art of connivance to visit Kathleen in person in the disguise of professions out of their "Oxford zone," which put their skills of deception to the test, leading to many chuckling moments. A cute, funny story. I especially like the idea of mashing uncooked potatoes with a hammer! The reader was pretty good too, and I would willingly listen to more of his recordings. College men stalk young woman. Better than Wodehouse? YES!!! Clever, laugh-out-loud funny -- will re-read it, for sure!